What’s your style? Preppy, Boho-Chic, Depends-on-the-Day thanks? No matter what your style is, you can work it in quality clothes at an affordable price when you shop consignment. That’s the kind of shopping that makes an Earth Mom proud. It’s good for the environment (reuse), humanity (no slavery), and your wallet. Did you know that the fashion industry is one of the biggest supporters of modern slavery across the globe? Fast fashion demands have been on the rise increasing the impact fashion has on the environment too. 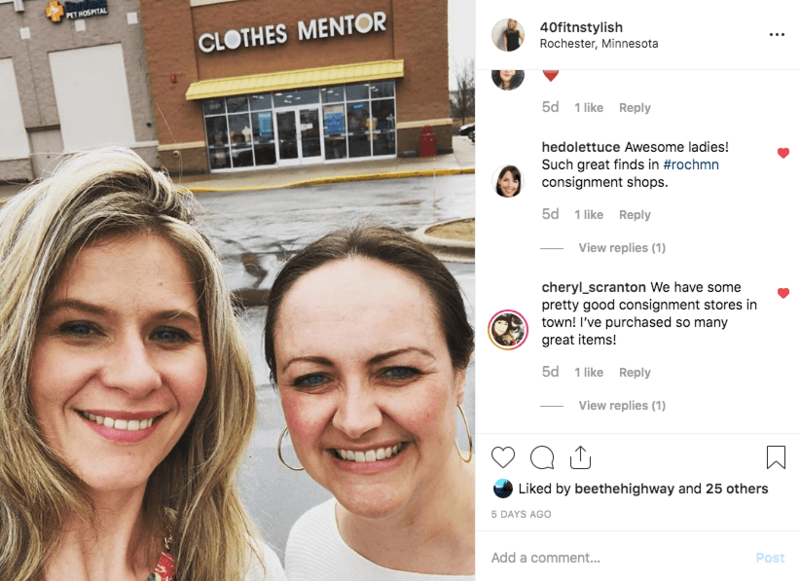 The need to not be seen wearing the same outfit twice in an Insta-feed (or similar social media) is a likely culprit of our “need” to have more items in our closet. Consider shopping consignment. Preowned pieces can be mixed in with new. Perfection is a pretty hard place to start. Rather than becoming a preowned purist, maybe just peruse consignment before the department store. A manager of a consignment store shared with me a few years back that as a store buyer she’s always looking for quality brands in styles that are in-fashion. It’s better than shopping fast fashion discount racks, because cheap clothes don’t wash and wear as well. Shop for staples and fun trends. The LBD (Calvin Klein, $11.20) isn’t going anywhere and the maxi dress (Banana Republic Factory, $12.80) seems here to stay. I found them both at Clothes Mentor. Can you picture the latter with a cute denim jacket? Shopping in a brick and mortar store? Shop with a friend. Then, if you get so super excited about a brand, a cut, a style you’ve been on the hunt for that you overlook the little things (as we all do when falling in love with anything), the friend can look it over with less emotion. They may also have great tips. As my friend Mariah and I looked at shoes she shared that she always double-checks the bottoms of shoes. If the tread is too worn, or nonexistent don’t buy the pair she advised. If you’re shopping online at a reputable site like ThredUP (save $10 using this link), the site will disclose the condition of the item. Save yourself the hassle of looking through descriptions by filtering by condition. This option is toward the bottom of the list of possible filters. Clothes Mentor merchandises by color, size, and style (tops, pants, skirts, dresses, etc.) and they put together displays with fun outfits that inspire fashion forward ideas. It makes the hunt manageable and fun. Another plus about shopping there is that they do not offer plastic bags. Bring your own, or carry items sans plastic. It’s just one more way for Mother Earth to be proud of us all. Second hand is one of the best ways to buy Lululemon apparel. If you’ve ever owned anything Lululemon, you know the quality. I bought my first pair of Lululemon leggings for full price about two years ago. I wear them every week at least twice a week and they’re still in like new shape. Buying a high quality brand second hand works wonders. We should know this by 40, yet it always seems to be worth repeating (often to myself when I love something on the hanger): Do make sure you love the fit. Buying great deals that you might fit into in a month if you stick to that diet you’ve been meaning to start, you’ll just be giving up valuable space in your closet. I haven’t watched her series, or read her book, yet her philosophy seems to be echoing on social media and in IRL conversations. IRL is “in real life” right? Keeping up is hard to do sometimes. Going out on date night in a pretty new-to-me dress with my guy definitely brings me joy sans guilt. I’m happy, my wallet is happy, no one was enslaved because of where I spent my money, and I didn’t influence the manufacture, or delivery of what I wore. Do your shopping habits bring you joy sans guilt? How do you make Mother Earth proud with your shopping style? I’d love to know. Let’s connect! You can find me on Facebook, Twitter, and Instagram.